Robin Hood and his "Merry Men" rob from the rich, give to the poor, and fight the dastardly Prince John and his evil plans. The Action-Adventure Sword/Fighting classic directed by: Michael Curtiz and William Keighley. 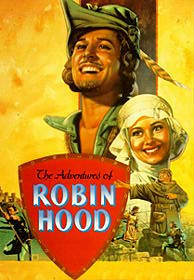 The cast includes: Errol Flynn, Olivia DeHavilland, Basil Rathbone, Claude Rains, Ian Hunter, Eugene Pallette, Alan Hale, Melville Cooper, Patrick Knowles, and Una O'Connor.